Firstly, not all the airlines have started this facility. Under this facility, when two travelers traveling together buy two seats; they can buy the third seat at half the price. Some of the airlines are starting to introduce this, rows of three economy class seats that are bought together that can be converted in to one large seating space. This facility is more conducive for travelers traveling with their families or for couples who prefer their own cuddling space. 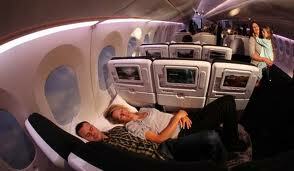 The cuddle class seats also known as the Skycouches would be launched only on some airlines like the Air New Zealand. In fact, Air New Zealand is set to launch this service from Auckland to LA in November. Boutique travel agency Travel Associates general manager David Lovelock said that class divisions in the sky are narrowing as airlines move away from just the traditional economy, business and first class cabin configurations. People want more, and airlines are preparing to give them more. Another, interesting news from the travel industry is the vertical seats. Yes, low cost carrier Ryanair has announced its plans to sell vertical seats. As the name suggests, vertical seats would be those seats where the passengers would be standing during their flight journey. Though, not everyone prefers having a standing journey. But the ones who prefer the same can pay less for their tickets.If these initiatives are successful at Air New Zealand and Ryan Air, they would definitely catch up with other airlines. And who else, but the passengers are definitely going to benefit from these innovative initiatives.